Benefits- Making compost isn’t magic, but using it, ahh, there’s where the magic begins! It's benefits are numerous. As a soil modifier, it adds organic matter, and even if you don’t garden organically, organic matter in the soil has great benefits. As a fertilizer, it can add micro-nutrients beyond the standard NPK, although exact quantities of these nutrients can vary due to the original materials that went into the compost. It can help break up clay soils and bind together sandy soils as well as improve soil aeration. The items in the photo are the raw (no pun intended) ingredients for natural fertilizer that will improve your garden. They will return some of what they took while growing. Besides organic matter, it also adds humus. Humus is organic matter that has completely decomposed to the point that no further decomposition will occur. Whole scientific papers have been written on the subject of humus and its chemical and physical properties. That discussion is beyond the scope of this article, however. Let’s just say that humus is a good thing and that compost contains humus, or materials that are on their way to becoming humus. Creation of compost is a pretty straight forward process. To see how nature does it, just take a walk in the woods If you scrape the ground, you will see layers of plant material in various stages of decomposition. From the top layer of last year’s leaves to the bottom layer of humus, this shows how nature over many, many years eventually creates topsoil. Now, humans, being the impatient creatures that we are, have come up with many ways to speed up the process over the years. The method you use will be determined by the availability of materials. One of the most widely used methods is the heap method. In this method, the materials are placed in alternating layers starting with some of your courser materials. Then alternating layers of drier materials (leaves, stems, etc. ), green materials (grass clippings, weeds, etc. ), kitchen scraps (peels, egg shells) and soil. Build the heap until it’s 4-5 feet tall, water each layer slightly and keep it covered. 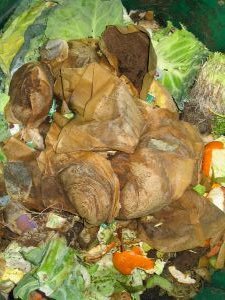 Let the heap sit for 3-4 months, and the result will be the best thing that a gardener can have, organic matter that is rich in humus. A note on using kitchen scraps- you can use almost everything except for meats, fats and oils, or breads. Egg shells, coffee grounds and uncooked vegetable scraps are excellent additions to your compost. Items that are not suitable for inclusion are dog and cat manures, diseased or infested plants, weeds such as wild morning glory or acidic plant materials such as pine needles. If you have access to manure from farm animals such as cows, horses, poultry or rabbits these will speed up the decomposition of the other materials as well as condition the manure so it's ready to use in the garden. There are several ways that you can speed up the production also. Increasing the ratio of nitrogen-rich materials by adding more grass clippings or fresh manure is one way. You can also add nitrogen rich fertilizers in small amounts. Increasing the amount of oxygen that’s available to the micro-organisms is another way.The easiest way to introduce more oxygen is by turning the pile occasionally. There is nothing wrong with just building the pile by itself, but a lot of folks prefer to build some type of container system. A simple bin system uses a section of metal or plastic fencing that can be tied together with wire or rope. The length of the fencing piece will determine the final size of the heap. A section of fence or wire cloth 12 feet long will give you a bin that's about 4 feet in diameter. This is a nice, manageable size for the home gardener. You may wish to add a piece of wood every couple of feet to stiffen the fencing until the bin becomes full enough to stand on its own. When the container becomes full, you can just unwrap it and start another pile, or turn the material in to the empty container to aerate it. Wooden pallets also make a good enclosure. The only type of compost bin that we’ve found doesn’t work very well is the so-called compost tumblers. While the theory behind them appears sound, there is generally too little material in them to retain the heat that is generated in the decomposition process. Add the fact that they are up in the air, resulting in further heat loss and the results are less than satisfying. Despite our best efforts, the compost won't be the crumbly, brown, unrecognizable material that you often see in articles about compost; just as our soil doesn't look like the soil on the garden shows. That's OK, you can use it anyway. We like to sift ours with old bread trays that we scavenged from the dump. These have 3/4 inch square holes and fit on a wheel barrow. Anything that doesn't make it through the holes goes back to the pile. This material is fine to use in the garden, the worms will finish the job and your plants won't know the difference.